Our latest addition to improve the thermal performance of our home is an Efergy E2? What’s that? It’s a wireless electricity monitor which the promotional blurb sells to me as having all the features of the best selling elite plus a powerful PC software package to track your energy usage on your computer. 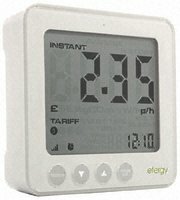 The e2 also monitors your carbon dioxide emissions allowing you to determine your carbon footprint from your electricity monitor or your computer. Simple graphs like this show your electricity use in kilowatts, carbon tonnes or $s. I received it recently as a generous birthday present. How’s it going? Well at the moment it’s not. The component that has to be wired into the electrical switchboard of course must be installed by an electrician so I am expecting our electrician to arrive to do that some time in the next two weeks. I have seen some reference on review websites to the fact that with our heavy metal Australian switchboard boxes, sometimes the wireless transmitter at the switchboard can struggle to make contact with the indoor advice, so we’ll check that with the electrician and see what she thinks. Then the monitoring begins. We’ve moderated electrical use behaviour quite a bit in the last few years but I’ve heard even some reasonably practiced efficiency types say that they’ve been surprised how much these devices helped them to further moderate their behaviour. The fun will begin shortly. Now back to those caveats I’ve added to every blog entry in this series.